Formerly G.verticillata. This is a must-have for collectors of large bamboos. Breathtaking variegation on massive culms and sheaths. It is a tight clumper and is generally branchless at the base. Will grow to at least 60' tall with 5" diameter culms in Florida. Min. temp 28°F. Min USDA zone: 9b. Click to find your zone. Culms highly variegated with cream colored stripes. This smaller variety of G.pseudoarundinacia was erroneously referred to as G.maxima in Florida (no logical explanation - Maxima is a synonym for the LARGE variety). Correctly identitified by Dr. Elizabeth Widjaja in 2003. This variety grows to 45' tall. Minimum temperature 28 degrees F. Min USDA zone: 9b. Click to find your zone. Feature photo in the book Bamboo World. Beautiful tight habit with persistant culm sheaths. Brought to the continental U.S. in October 2002. Maximum height is yet to be determined but 30' is my guess so far. Min temp also unknown - shouldn't be able to handle more than a few degrees F below freezing. Min USDA zone: 9b. Click to find your zone. 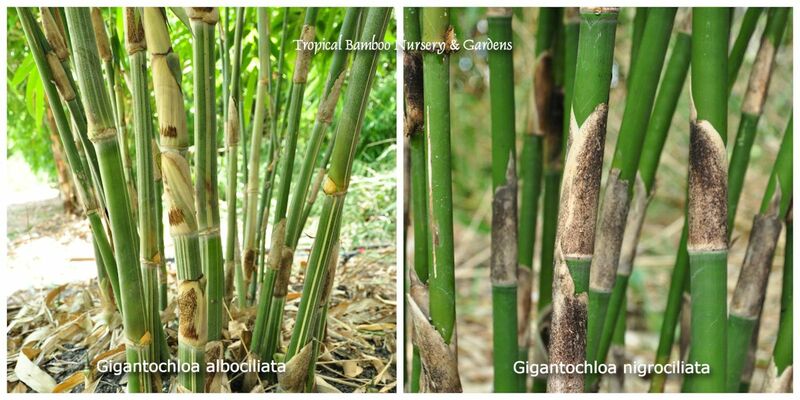 A giant bamboo with large leaves and culms that are striated cream/green. Similar in appearance and form to Gigantochloa pseudoarundinacea. The main difference between these two species is that the culms of G.robusta are smooth and glossy. Will grow to about 50' tall with 4" dia. culms in South Florida. Minimum temp. 29 degrees F. Min USDA zone: 9a. This variety of G.robusta differs in that the culms that are striated GOLD/green, rather than cream/green. Side by side, the difference in culm color is distinct. Imported into USDA quarantine in 2016 and released to us in early 2018. Will grow to about 45' tall with 3" dia. culms in South Florida. Minimum temp. 29 degrees F. Min USDA zone: 9a. A new introduction from the islands of Indonesia. White stripes on canes and large leaves. Should grow to 25'-30' with 1"/2" diameter culms. A smaller black bamboo for gardens. Green culms darken to black with age. Green stripes sometimes remain on the black culms, creating a striking appearance. The Malaysian Black is a good alternative to Gigantochloa atroviolacea, which is sometimes too large for smaller gardens. The form is similar to G.atroviolacea but MAY grow to only about 1/2 the mature size. We're still test-growing this new import to confirm its mature size. Note: This is the same species that has been sold under the trade name "Black Diamond". Should grow to 20' with 1" diameter culms in Florida. Minimum temp. 29 degrees F. Min USDA zone: 9a. Click to find your zone. A new introduction from the Malaysian state of Sarawak on the island of Borneo. It grows in the classic fountain form typical of Gigantochloa. Sporadic light pin-striping on the culms add ornamental intrigue. Matures at around 30' tall. Minimum temp. 30 degrees F.
From southern China and Thailand. G.tekserah is a synonym for G.macrostachya. Culms with long internodes are erect or arching outwards. Sometimes yellow-striped on lower internodes. 25' with 1.5" culms in Florida. Min. temp 30°F. Min USDA zone: 9b. Click to find your zone. A large, woody, thorny, green bamboo with erect culms. One of several South American timber bamboos in this genus. Our stock originated from seed that was collected and germinated by Gib Cooper of B.O.T.A. Frequently confused with G.angustifolia. May grow taller than listed. 80' with 7" diameter culms in South Florida. Min USDA zone: 9b. Click to find your zone.